Are you a chocolate and peanut butter lover like me? 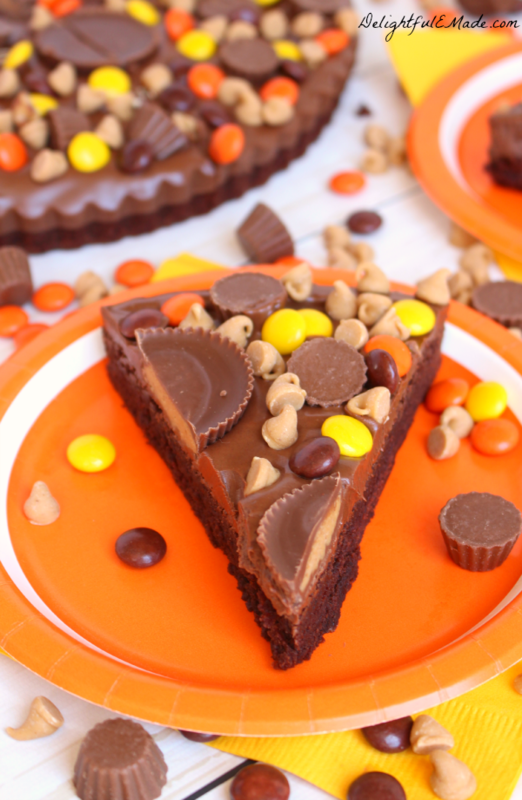 If so, then you’ve got to try my Ultimate REESE’S Brownie Pizza! This fantastic dessert pizza is the perfect snack time treat for when you’re hanging out with friends and family during the big basketball tournament or anytime you’re looking for a sweet snack that will satisfy you and your hungry team! It’s loaded with all of your REESE’S favorites, including the classic REESE’S Peanut Butter Cups, Minis, Pieces and Peanut Butter Chips! 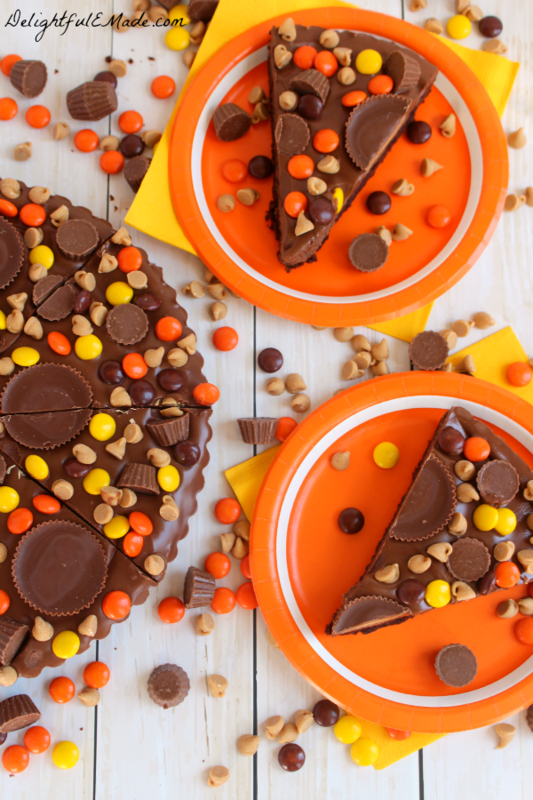 All of these fantastic REESE’S favorites turn a regular brownie into an awesome sweet snack pizza. 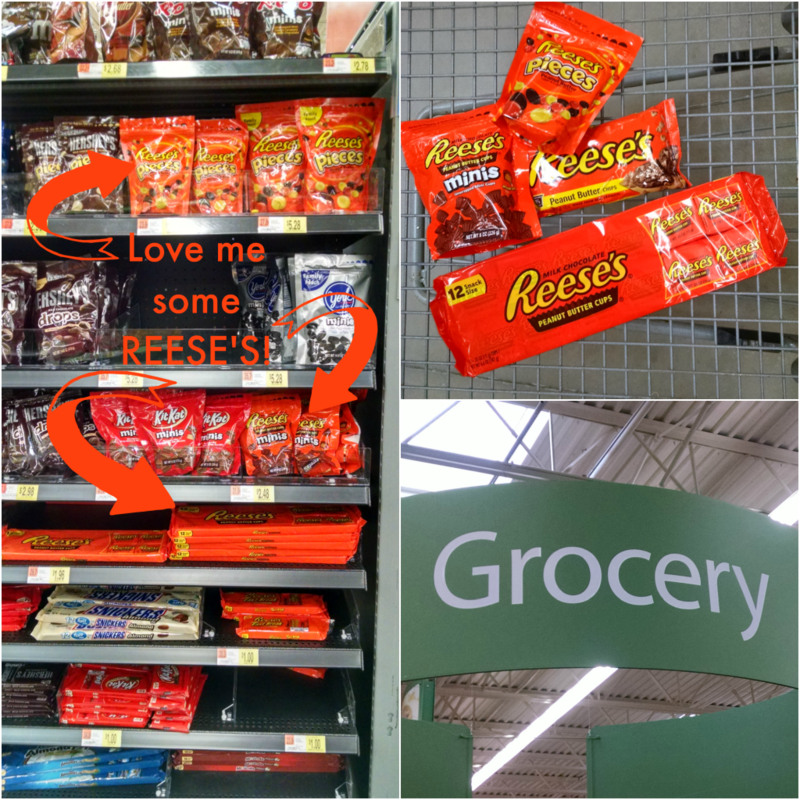 You can find all of these awesome REESE’S treats at your local Walmart! Check the candy aisle for the REESE’S Peanut Butter Cups, Minis and Pieces. 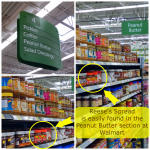 The REESE’S Peanut Butter Chips are located in the baking aisle. Do you have a favorite REESE’S snack that’s perfect for cheering on your favorite team? Does your snack have game? REESE’S is now sponsoring the Snack Talk Challenge, which is an exciting opportunity to submit your best game time REESE’S recipe. Show us your #SnackTalk for a chance to be nationally recognized! The final winner will be seen on www.ReesesSnackTalk.com, CBS and Walmart.com! 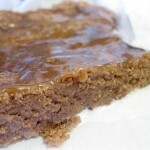 Submit your game-winning recipes here at www.ReesesSnackTalk.com. Look for the special REESE’S Snack Talk Challenge display highlighting the challenge and all of your REESE’s favorites at your local Walmart stores. See if your Walmart is participating here. This brownie pizza was really easy to make. I started off with a basic brownie mix for the base crust. I baked it according to the box directions, and let the brownie cool completely before frosting it with a thick, delicious chocolate peanut butter frosting. From here, I added all of my REESE’S favorites for toppings. This dessert pizza is perfect for when you have friends and family over to watch basketball. 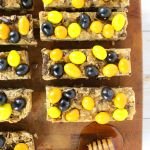 Everyone loves a sweet snack while they’re cheering on their favorite teams! 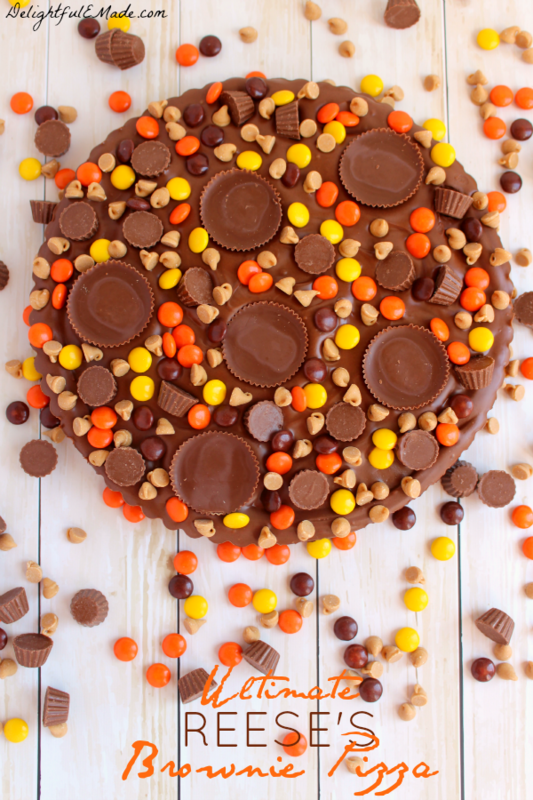 For anyone who loves a sweet snack, this Ultimate REESE’S Brownie Pizza is a “slam dunk” any way you slice it! 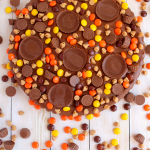 Loaded with REESE'S Pieces, Peanut Butter Cups, Mini's, Peanut Butter Chips, and a chocolate peanut butter frosting, this dessert pizza is the perfect snack time treat! Preheat oven to 350 degrees. Spray a 10" tart pan or deep dish pizza pan with cooking spray. Set aside. In a mixing bowl combine the brownie mix, eggs, oil and water. Stir until completely combined. Pour brownie batter into prepared pan. Bake at 350 for 23-25 minutes. Let brownie cool completely. For the frosting: In a medium microwave safe bowl, add the chocolate chips and peanut butter. Melt for 30 second increments, stirring in between until completely melted. Pour over the cooled brownie and spread evenly. 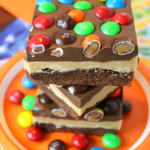 Add the REESE'S Peanut Butter Cups, Minis, Pieces candies and chips over the frosted brownie. Refrigerate for the frosting to set. Keep refrigerated until ready to serve. Refrigerate any leftovers in an airtight container. 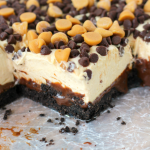 This is definitely one of my favorite ways to enjoy chocolate and peanut butter! I love adding extras to brownies and REESE’S Peanut Butter Cups are an all-time favorite at our house. What’s your favorite REESE’S candy? 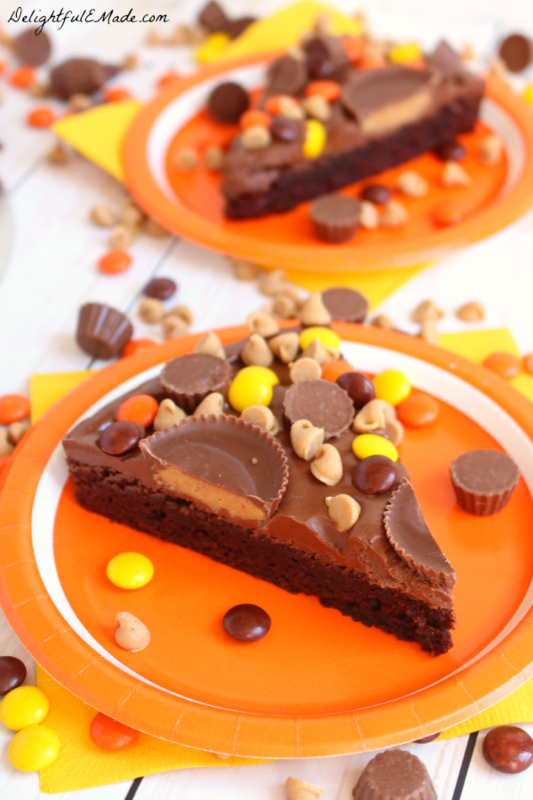 I came across your Ultimate Reeses Brownie Pizza on the Weekend re-Treat Link Party and I am SO HAPPY I did. 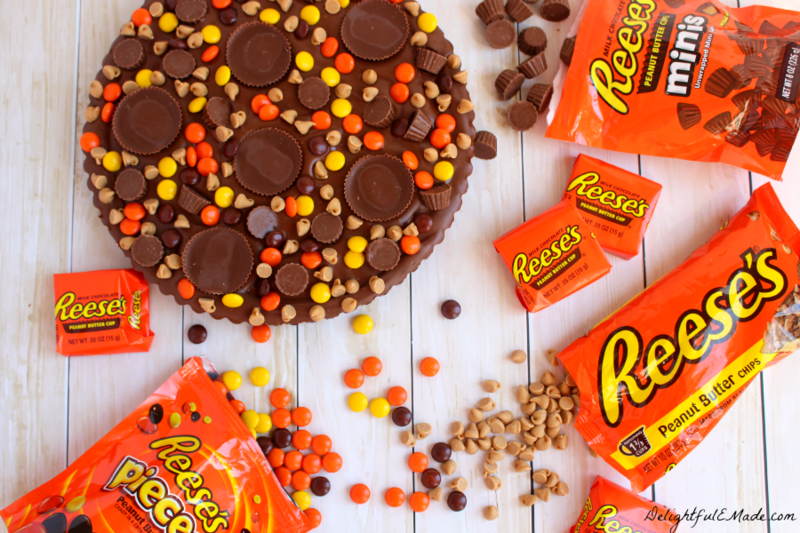 I love Reeses everything and this looks positively heavenly! I can't wait to make this. Thanks for sharing! Pinned! This looks amazing! Can't wait to try it out. I'd call that pizza fully loaded. Thanks for sharing at Family Joy Blog Linkup! I think I got a sugar high just looking at this beauty! Yum! All that chocolate/peanut butter is calling my name. I have to save this for later! Thanks for joining the Family Joy Link Party! 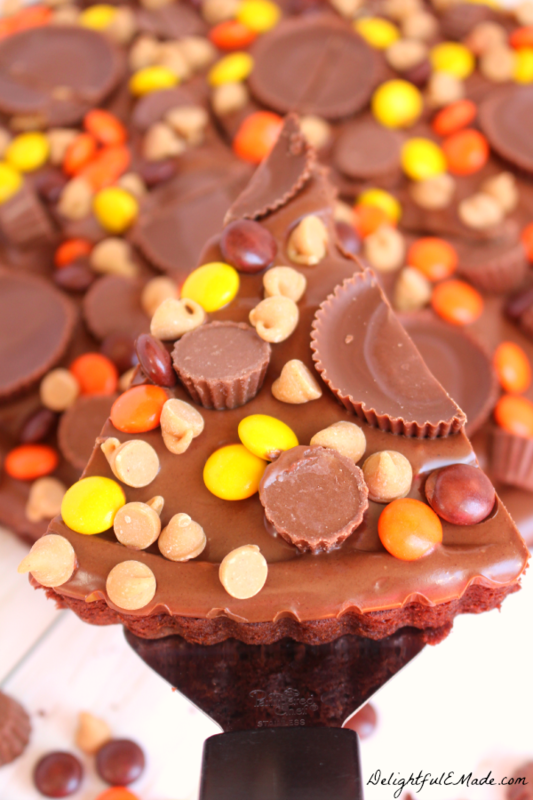 I love reeses pieces and brownies!! It looks so delicious, I would demolish it! Thanks for sharing at #bloggerspotlight!